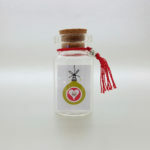 Gorgeous Tiny Handmade Greetings Card In A Miniature Glass Bottle. 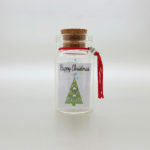 Each tiny handmade Christmas card has a Swarovski crystal on it and a message on the back. 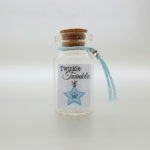 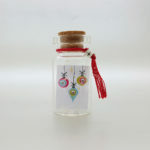 The card is placed inside a miniature glass bottle with a sprinkle of glitter snow. 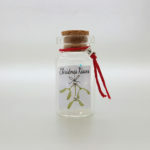 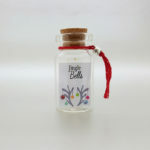 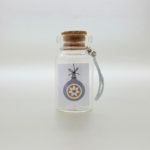 The bottle is finished with a tiny metal star bead attached to embroidery thread and comes in a little white organza bag. 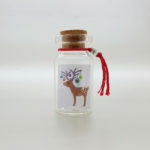 A perfect keepsake gift to treasure and can even be hung on a Christmas tree as a lovely decoration. 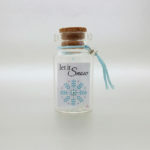 This tiny bottle comes in a little white organza bag.